Sometimes I get tired of secondhand shopping. Wouldn't it be grand to throw a new spring wardrobe in the suitcase without having to iron a thing? But it's easy to pull the next size clothes from the closet instead. I am so spoiled by shopping without seasons. 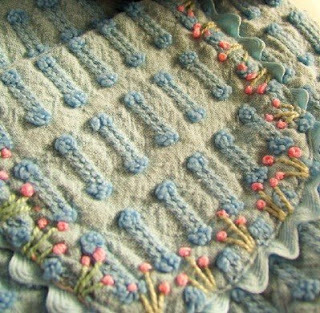 Speaking of spring clothes, don't miss Half Pint House's darling cardigan hack! Be safe on the trip, have a lot of fun. Your daughter's clothes look wonderful. I am sure the whole family will look great. I hit my fave consignment shop today and gathered up about a dozen summer dresses before I remember that my daughter really needs, maybe, two. So I put a whole mess of 'em back and then moved to the rack two sizes up and picked out one as a reward for being so rational and dispassionate in the face of abundant cuteness. 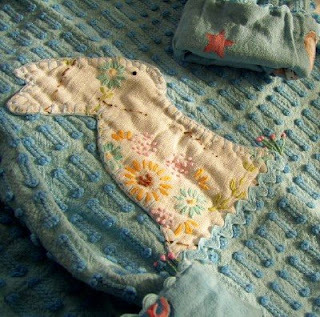 Love the vintage fabric on the bunny. What a find! So adorable. As mama of two boys I love it when you share the adorable things you get for Elise, it's my ooh & aah fix. :) Hope your travels are safe & fun. Thanks for the linky love today. My stats went nutso and I wondered why... found out it all came from you! This really is so cute!...it HAD to come home with you! I know just what you mean about being spoiled. I love to go "shopping at home" when the weather suddenly shifts or one of the kids has an overnight growth spurt. Have a wonderful and safe trip. I can't wait to hear about it! That jacket is adorable!! Hope you have a great trip. Thanks for sending us over to see the cardigan hack, it's adorable...just like that little bunny jacket you found! Thrift store shopping is definitely the way to go if you want to find a one of a kind treasure. I'm so glad that I found your site. I'm always on the look out for good money saving advice. That is adorable! As someone newly converted to thrift shopping, I am super inspired by this! Looks like a rare boutique find! What a treasure! Thrifting is the only way to go for me! Cute, but looks kind of dingy. I've been developing a new spring wardrobe out of the thrift stores and Ross here. I was promised some shopping money by the boyfriend for Christmas. So, now I'm using it. I was able to find a jacket that I love so much. It's from White House/Black Market. I bet you it cost around 70 dollars or more to start with. 7 dollars is what I paid. Joy! Oh so sweet, I just love that jacket. TOO TOO CUTE!! Love that bunny sweater! See, the OLD me would offer you $10+ shipping for the jacket just because I want it. But the new me realizes that I really should spend the money elsewhere. :) I am learning!!! The jacket is as bright and cheerful as any vintage material would be. If it looks dingy, it is only from the shadow in the photos. Even then, it would still be a bargain for $1.29.